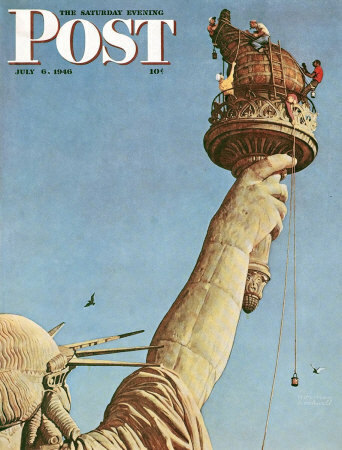 Statue of Liberty, a Norman Rockwell painting, appeared on the cover of The Saturday Evening Post published July 6, 1946. This is another favorite of Rockwell collectors, a classic enduring image of the world Rockwell painted. An alternate title for this painting is Working on the Statue of Liberty. This painting was Rockwell's 239th overall out of 322 total paintings that were published on the cover of the Saturday Evening Post. Rockwell's career with the Post spanned 47 years, from his first cover illustration, Boy With Baby Carriage in 1916 to his last, Portrait of John F. Kennedy, in 1963. This was also the third cover for The Post in 1946. In 1946, there were seven Norman Rockwell Saturday Evening Post covers published. The original oil on canvas painting, 24 x 14 inches or 61 x 35.5 cm, was once owned by Director Steven Spielberg. Spielberg donated the work to the official White House Collection in 1994. It has been on display in the Oval office throughout the terms of Presidents Bill Clinton, George W. Bush, and Barack Obama. on page 168 of Norman Rockwell, A Definitive Catalogue by Laurie Norton Moffatt. One study also appears in the Norman Rockwell Catalogue on page 168. Always topical with his paintings, Norman Rockwell did not miss the oppurtunity to paint workmen on the Statue of Liberty. The Statue of Liberty was designed by Frédéric Bartholdi and dedicated on October 28, 1886. The robed female figure of the statue represents Libertas, who is the Roman goddess of freedom. She holds aloft a torch in one hand and a tabula ansata in the other arm The tablet has inscribed upon it the date of the American Declaration of Independence. A broken chain lies at her feet. The workmen in the painting reveal the scale of the statue, which is just over 150 feet tall. The bird flying also hints at the dangerous height that these workers have scaled. The actual height off the gound of the work being done is well over 300 feet. I hope none of these fellow are afraid of heights. The Statue has been repeatedly worked on, renovated, strengthened and shored up throughout its life on Liberty Island. Statue of Liberty was only one of 322 Norman Rockwell Saturday Evening Post covers; Here is the list of Norman Rockwell Saturday Evening Post cover illustrations. The work being done in this painting is cleaning the torch. The torch is made of heavy amber glass. In July, the task of cleaning the glass on torch is scheduled. Lady Liberty's light must shine and brightly. Do You Have A Great Story, Opinion Or Contribution About Statue of Liberty?